JAMES F. GOSSETT is a partner at Howe & Hutton, Ltd. He is now in his second tour of duty with the firm, after an extended hiatus with another Chicago firm from 1993 to 2009. He graduated with honors from Northwestern University's Medill School of Journalism in 1973, and he earned a Juris Doctorate degree in 1976 from the Northwestern University School of Law, where he was on the Editorial Board of the Journal of Criminal Law and Criminology. That year, he joined the staff of the National Association of Realtors®, where he served as Director of State and Municipal Legislation. 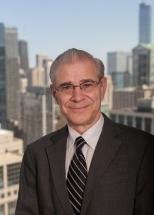 Then, in 1979, he took a position on the staff of the International Association of Assessing Officers, where he was Director of Publications and Association Counsel until 1985, when he first applied his in-house experience to representation of other nonprofits at Howe & Hutton. He engages in the general representation of associations, professional societies, charities and other nonprofits, but he also has extensive experience handling all types of intellectual property matters for various other clients. Admitted to practice before the Supreme Court of the United States, the Supreme Court of Illinois and the U.S. District Court for the Northern District of Illinois, he is a former chairman of the Chicago Bar Association's Trade and Professional Associations Law Committee, a former instructor for the U.S. Chamber of Commerce Institute for Organization Management, and an active member of numerous professional organizations, as well as a contributor to various publications on nonprofit organization and intellectual property law.